At its core, there are two main practices that inform the path of a martial artist. One is the external way (combat/fight focused) and the other is the inner way (development-focused). Both of these intersect, overlap, and weave through each other. The biggest challenges, like recognizing personal ticks, breaking bad habits, and breaking bad habits, absolutely rely on inner work. My brother-in-law has been shooting for a few years now, and uses it both as a way to decompress (through focus) and a way to exercise (draw-and-hold). My ex had uncovered all my equipment and wanted to shoot, so I found a few ranges and bought more arrows. When we split, I remembered the reason I had bought them in the first place: I wanted to learn mounted archery. Shooting for three hours a day on Saturdays and Sundays helps. It gets me out of the house, and it helped make the hobby mine again; rather than another remnant of the life we shared. I can’t think of a more soothing environment than a range nestled in a quiet grove, fresh with morning mist. As you can see, I need some help. This is what it looks like when your inner chaos affects your technique. 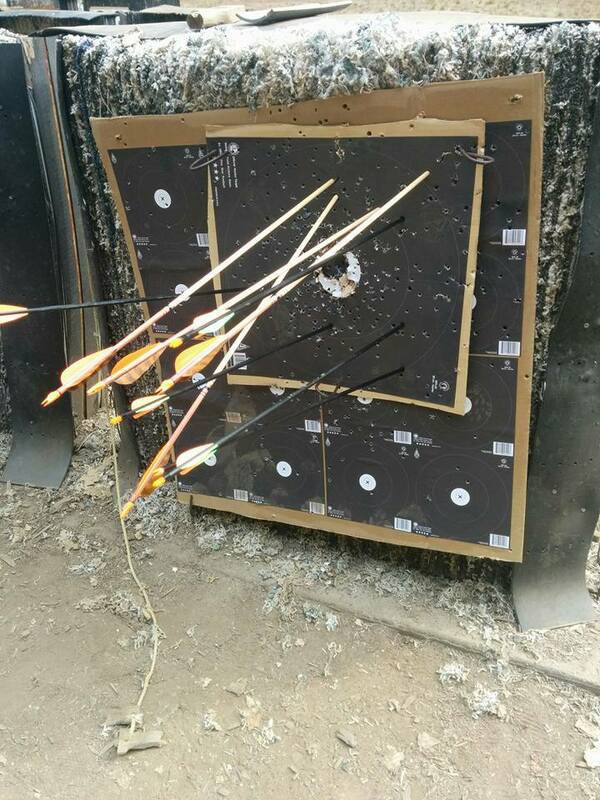 Practice pays off to an extent — all the arrows were on the paper — but there was little accuracy and less consistency. Hurt, nerves, fear, frustration, all these things eclipsed my awareness. It was the same at Worldcon. I played push-hands with Nick Mamatas and Arthur Chu during morning tai chi. The second I lost focus or became agitated that I wasn’t winning, I lost. Arthur is legendary for being immovable, though. One story describes a time he was gazing out at the ocean and a friend jumped him as a joke. The friend literally bounced off and fell on the sand. Some people are naturally grounded. The rest of us have to work at it. On the advice of Mike Loades, I sought out Justin Ma to learn the thumb ring technique (used in China, Mongolia, etc. ), which would help me shoot from horseback. This method involves hooking the string around your thumb, as opposed to Mediterranean draw which is the three-finger technique you’ll sometimes see in movies. In addition to this particular technique, Justin gave instruction on body position, how different muscle groups work together, and even such small details as where your draw hand goes after the release. It turns out that the hand continues to move backward in a kind of graceful flow. I’m guessing that this motion helps keep your bow arm and shoulder in a more consistent position, so you’re not pushing the arrow to the left or right at the last second. Justin also had a wealth of equipment knowledge, and told me that my arrows weren’t sticking properly because they’re too light weight — it had nothing to do with my bow or draw length. That made me feel better. Knowing that some of the factors working against me weren’t my fault took the pressure of perfection away. I settled into breath, body position, and observation with the goal of being consistent and present; not perfect. Perfection is tomorrow’s concern. All those small details come together to produce a shot. Technique goes from your heels to your lats to your arms to your breath — that’s lot of muscle memory to attain. That’s all inner work. To achieve body awareness I had to let go of two things: my negative emotions, and the bullseye. I focused on position, and breathing. I relaxed. I paid attention to what I was doing, rather than what I should be doing (hitting the center, or “healing faster” from my breakup). It seemed to help. This was one of my last shots from the same day. This entry was posted in Arms and tagged archery, arthur chu, justin ma, mike loades, nick mamatas, san francisco bay area, worldcon on September 14, 2015 by Setsu.